I remembered I went through puberty with a breeze, having not much of an issue with any pimple breakouts on my face and I thought I was a lucky girl. But oh well, it's not that it didn't come, it just came late. Came early adulthood, and I started breaking out like mad. It got so bad that there wasn't an inch of space on my face that wasn't covered in bumps. I tried treatment creams after treatment creams, nothing seemed to work, and I was so depressed. But eventually, it went away. But not before leaving traces of its past existence on my face. They were the reason why I love using filter so much while taking selfies. Oh well! Just imagine how elated I was when I received the invitation from Samplestore to receive a sponsored package treatment of ClearSK's Aqua Acne Clear Renewal Facial! Founded in 2008, ClearSK is a one-stop provider of expert-guided medi-aesthetics solutions for the face and body, using medical technologies designed and tested by medi-aesthetics experts. ClearSK has a wide selection of medi-skincare and medi-slimming treatments that are personalised and prescribed by aesthetics experts to custom-fit the unique make-up of the individual's skin and body. 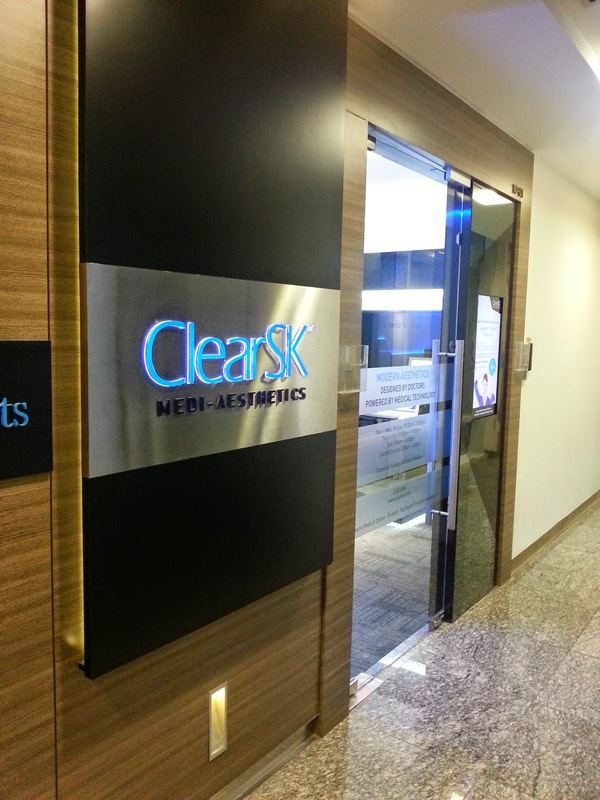 Conveniently located in 12 outlets island-wide (Novena Medical Center, Velocity, Orchard, Toa Payoh, Tampines, Jurong East and other upcoming 6 outlets), ClearSK offers every client a holistic non-invasive treatment program at reasonable prices, combining high-tech facials and medi-slimming treatments based on innovations in cosmetic lasers, focused energy, and medical grade skincare ingredients. The Aqua Acne Clear Renewal Facial helps to get rid of dead skins, maintenance of acne prone or combination skin, correction of acne marks/scars, reducing fine lines and balancing uneven skin tone. 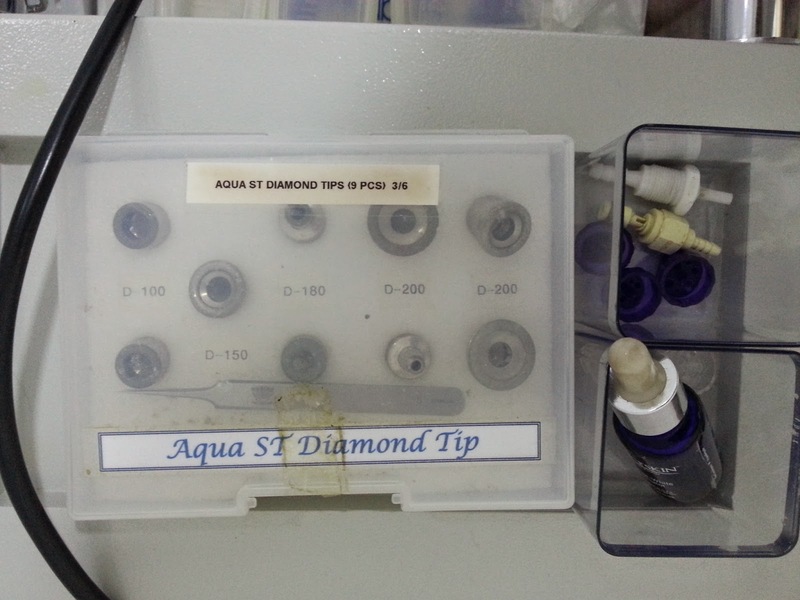 It is a 3 steps procedure starting with Diamond Microdermabrasion, which is in clinical grade diamond chips that will helps to exfoliate the superficial layer of the skin. This is followed by Aqua Exfoliation using acids, and will depend on each individual skin types. The acid treatment will help to deep clean and remove the oil clogs. The final touch in this facial treatment is what we called hydration infusion, which prevent over stimulation and drying of skin. For for faster result, combining treatments such as IPL/LASER/Light Emitting Diodes is highly recommended. For my first 2 treatments, I was scheduled to visit their branch located at Velocity@Novena Square. Located conveniently at level 2, right opposite a hipster-looking cafe, it was hard to miss the bright deep sea blue light emitting against a clean, stark white interior. Upon entering, I was tended to by a cheery staff, dressed in crisp white uniform, and politely asked if I could wait until my appointment time to start my treatment, for I was a good 15 minutes early. And of course, I didn't mind, for there's Oreos around to 'entertain' me. And true enough, at 6:30pm sharp, a therapist came up to me and showed me to the room. It was a pretty small and clean room, with a cabinet for me to keep my belongings (and also a pull out mirror inside for the vainpots ladies to check their appearances after the treatment), and a comfortable-looking bed with soft, fluffy comforter blanket. Frankly speaking, I've visited a handful of facial & spa parlour, and this is the very first time I've been provided with a comforter blanket! There's a good reason for this as well, I reckon, for their aircon is really pretty cold. 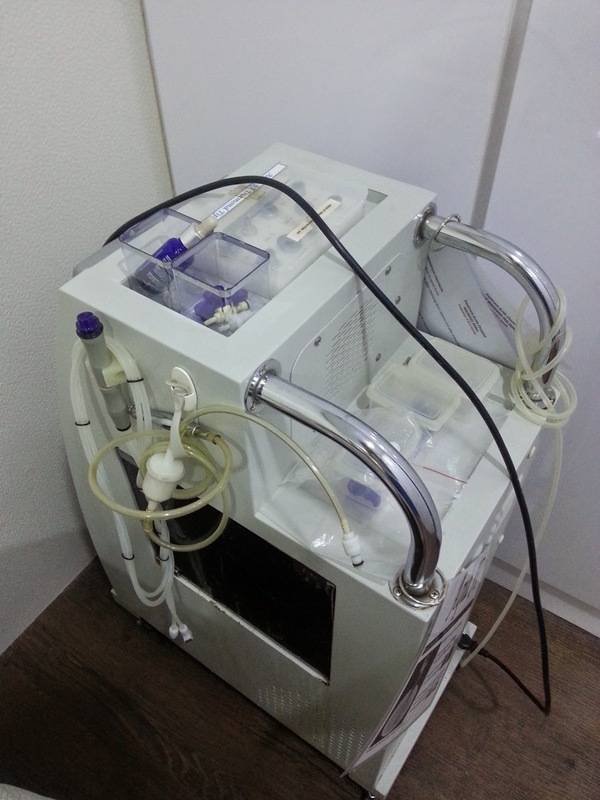 And after pulling the machine over next to the bed, the therapist started the treatment by cleansing my face and then running the diamond microdermabrasion (DM) tool on my skin, starting from my neck up to my face. I was still pretty worried for some stinging sensation, for "exfoliate the superficial layer of the skin" sounds just like it, but I was pleasantly surprised to feel that the process felt nothing more than just some suction running around the surface of your skin. And after completion of the DM, the therapist removed the disposable portion of the tip, which has turned a dirty shade of grey with all my dirt and dead skins caught inside, and showed them to me. And according to her, mine is still pretty okay, judging from the fact that I work in a highly dusty and dirty construction environment, for she has seen other ladies' turned totally black. And so, after the DM, the therapist proceeded with the acids using another equipment, which releases minute amount of the acids onto my face while she massages them into my skin. She first releases salicylic acid, which helps with deep cleansing of my pores. Then, came lactic acid, which helps with improving my skin texture and hydration level. Lastly, it was a good dose of hyaluronic acid, which helps to greatly hydrate my dry skin, which might be made even drier with the DM and acid deep cleansing. Having tried acid peel once, I was even more worried for the acid part of the treatment, for my past experience really did sting pretty bad. But once again, I was pleasantly surprised to feel absolutely no form of discomfort as the acids were released and massaged into my skin. And finally, the therapist left me to rest with a hydrating sheet mask for about 30 minutes before completing the entire facial session with application of toner and moisturiser. As my treatments were all schedule in the late evening and ended around 8 o'clock at night, sunscreen application was omitted. Otherwise, applying suncreen on the skin will be extremely important after the treatment, for the skin will still be on recovery mode. We're also recommended to use minimum SPF 30 sunscreen before heading out, and avoid too much exposure to sunlight and any abrasion actions on the skin while the skin recovers. 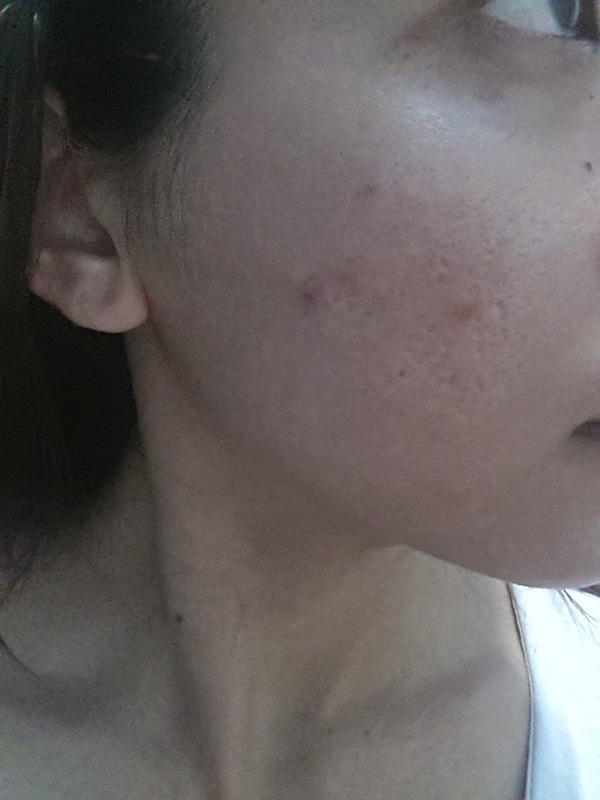 And now, after 3 sessions, let me show you the difference in the condition of my skin. Before, left and right cheek. And after, left and right cheek. Pardon the horrible lighting in the after pictures, which totally didn't do the overall obvious brightening of my skin tone from the treatment any justice. 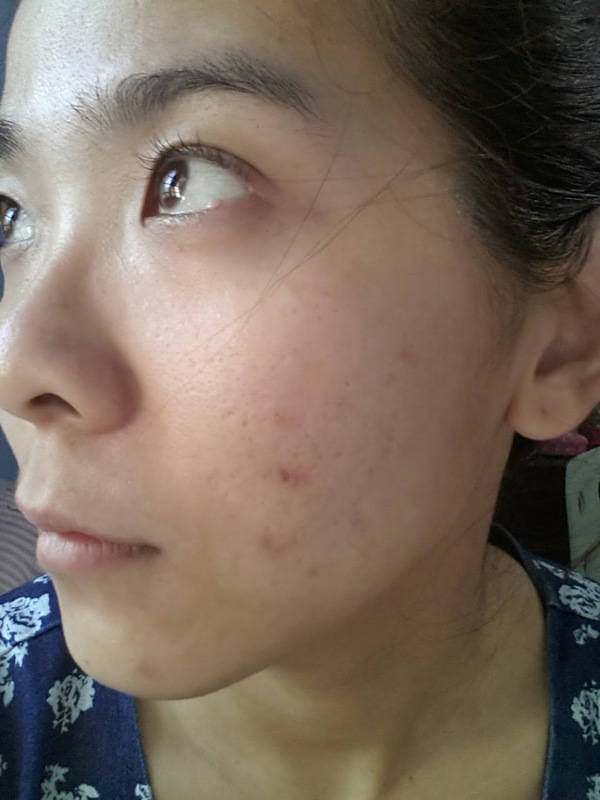 But with the exception of a newly erupted pimple on my right cheek, you can easily see that the acne marks (angry red spots) has gone down quite a lot, and I felt that my skin unevenness has also smoothen out slightly, albeit hardly captured in pictures. So yup, I do feel that this facial treatment is quite worth the penny, and if you're also facing skin problems like clogged pores, blemishes and acne marks, why not give ClearSK a try too? I don't dare to go for facials anymore due to the hardselling that a lot of shops use on their customers. But looks like ClearSK seems good to go! Based on the different lightning, it's pretty hard to judge the results. Anyway, this place look great. I've been always skeptical trying out facials because I'm too afraid of side effects. I would rather go for and do the natural way like drinkings lots of water, etc. Well when i was teenager I used to have lots of problems but after going to a lot of dermatologists, they gave me pills to use for couple of months and till now I dont have any problem. But if i will have in the future i ll conciser this method. 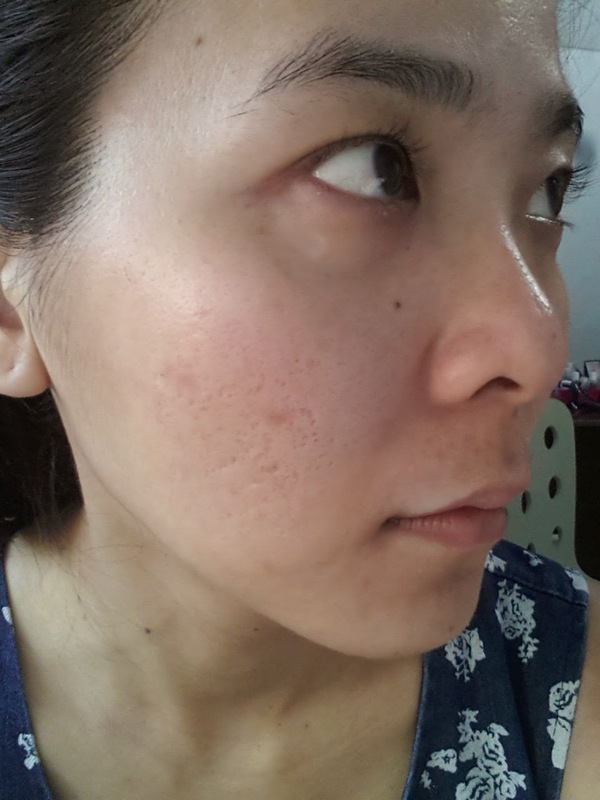 I saw puberty bring a detrimental effect on my friend's skin, she still has marks on her face and I think these procedures are exactly for her, so I will definitely recommend her to try them out! Their clinic looks posh and expensive. But do they have actual medical doctors there at all times for emergencies? Are the "therapists" actual dermatologists? Or just trained laymen? this treatment feels quite effective! i might give it a try as well - i suffer from the same. Such a fancy looking clinic! Best part of this treatment seems to be that there's no stinging skin! :) Next to the oreo cookies, of course. The oreos make the Wait Worthwhile. The effects of the treatment are quite obvious. 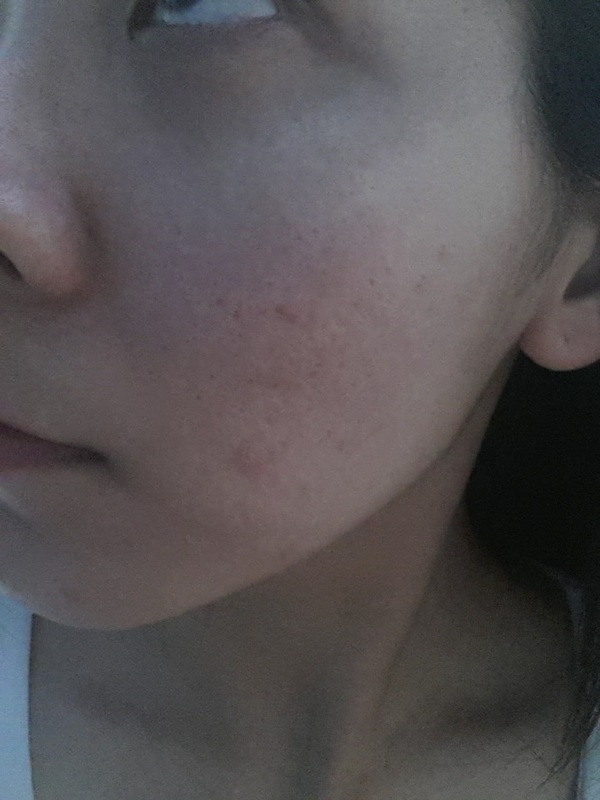 Aqua Acne Pure would really help in cleansing and purifying the skin. It would also help prevent acne breakouts. I haven't done anything to my face aka facials but I can really see the after effects of your skin! Awww... Oreo!!! My fav. biscuits~~~ Recently I have tried a Carbon Blast Laser Facial Skin Treatment too. Skin improve. yeah! I can see the difference in the texture of your skin. It looks hydrated and cleansed. Keep it up. wow glad to hear that it actually works on you! Love your skin after treatment!